I was recently contacted and asked if I wanted to do a Baker Days review of their Letterbox cake. 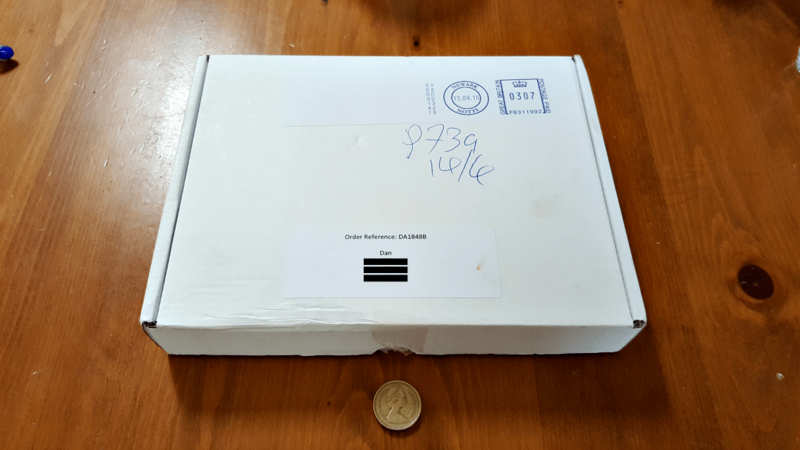 A cake through the post? I’d be mad not to say yes, surely? I’d seen the Letterbox cake a few times before. 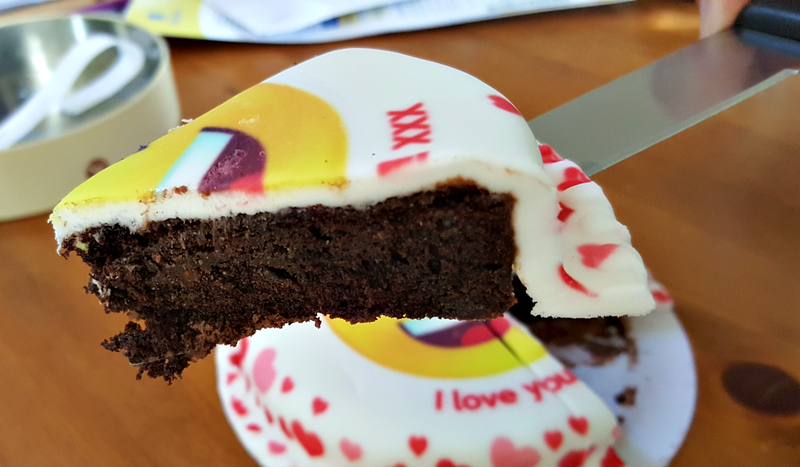 It seems to be a fairly popular review amongst bloggers and the idea is a sound one - A cake this is delivered in the post, through your day on a next day service. The letterbox cake is a 5″ round cake made of chocolate or vanilla sponge, covered in icing with a design of your choice. It arrives in a small rectangular box, designed to fit through most UK letterboxes. The more astute of you may see where this is heading. “most” UK letterboxes. Yes, you’ve guessed it. For whatever reason, it didn’t fit through mine, which meant a trip to the post office to pick it up. At first glance it looked as though it should fit, albeit snugly, but out of sheer intrigue I tried and sure enough, it wouldn’t go through. The box itself is very unassuming. Considering that the letterbox cake can be ordered as a surprise gift for someone, you really wouldn’t know what was inside. I was quick to open the box because - well, hello? Cake! - The smell was fantastic. I’ll come back to the cutting and tasting in a little while. Ordering the cake was remarkably easy. I simply headed over to the Baker Days website, decided which cake I wanted (in my case it was an emoji cake) and then chose the filling. The standard filling is Vanilla sponge, which for the 5″ letterbox cake was £14.99. Different sponges and flavours were available with Chocolate Chip Sponge Cake (made only with Belgian chocolate, apparently, and the one that I chose), gluten wheat free cake, dairy free cake and fruit cake all costing extra. 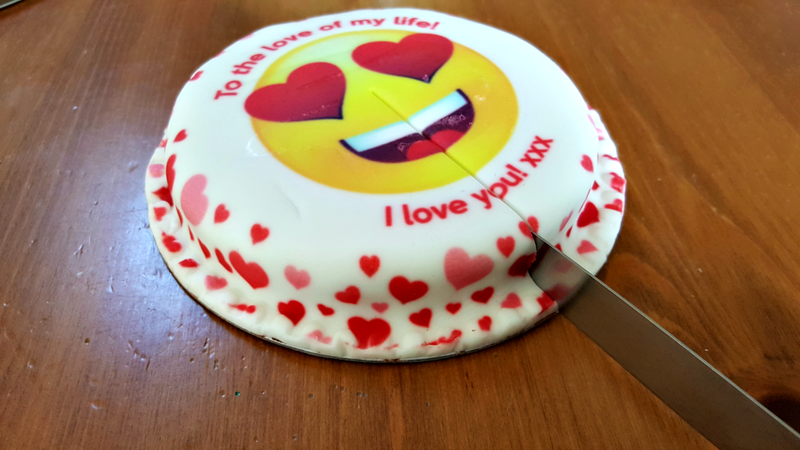 Another click takes you to a page where you can personalise the cake with your own choice of wording before you then enter your delivery details, billing details and - if you so desire - a small message for the outside of the pack. Generally speaking, any order placed before 2pm will be delivered the next working day, though there are payment options for delivery before 10:30am or (and I quote) “before 12:30 noon”. Standard delivery is £5.99 for a letterbox cake if you want it next day, but free delivery is available if you order up to a week before delivery. Back to the actual product. As soon as I opened the box, I could smell the cake and it smelt great. The box contained a small tin which held the cake, a blank card and a small tube of Love Hearts. There was a strip of white paper over the cake which gave instructions on how to remove the cake from the tin without causing any damage. Once out, the remaining packaging was removed and the cake was ready to be eaten - but only after it had been captured for posterity on the blog, of course. The cake was soft enough to cut, and sturdy enough not to break apart when doing so, and when a piece was cut we noticed that the inside was chocolate rather than chocolate chip. In truth I had misread the choice which does clearly say Chocolate Chip Sponge Cake (made only with Belgian chocolate). I was expecting a vanilla sponge with chocolate chips, but hey ho. Finally, after much photography and drooling, we had a piece. Stepdaughter, aged 9, thought it was lovely. Mrs DannyUK and I (aged over 9 years of age) were both disappointed. The cake was fairly heavy and lacked any real flavour. If there had been chocolate chips in the mix, they weren’t immediately in evidence. The sponge, while not dry, certainly wasn’t as moist as you would hope and it left a lot to be desired. Stepdaughter, although enthusiastic, notably didn’t have any more cake despite there being plenty left over. I asked Mrs DannyUK what she thought a fair price for it was. She ummed and ahhed, before finally settling on around £8. When I revealed that it was double that, plus posting, she couldn’t believe it. It’s such a shame, as the idea behind the venture is superb; Ordering a small cake which is on someone’s doorstep when they get home, and that has a 2-week shelf life, is brilliant. Unfortunately, it is poorly executed. I know that it’s a different thing entirely, but I would much rather go to Tesco and pick up a cake there for a fraction of the cost which would taste much better. 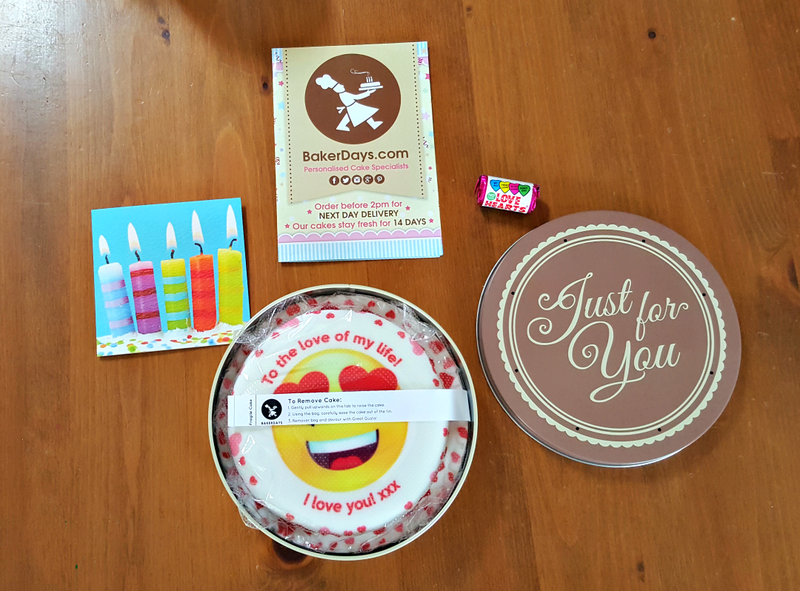 Having said that, there is a unique selling point for the Baker Days letterbox cake, and that is the delivery. It looks great, smells great and is delivered extremely quickly. Unfortunately, for me, it needs to be cheaper and better quality before I’d order again. I was given this product for free in exchange for an honest review. A full disclosure policy is available on the website. These letter box cakes are pretty fantastic. I tried one at Christmas time and was really impressed. A great gift idea!